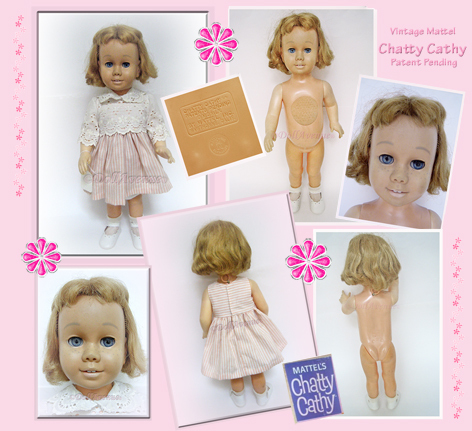 From my great aunt's estate is this vintage 1960s Chatty Cathy doll. Chatty Cathy is in overall good condition and marked on her lower back with the square patent pending mark (see picture). She has the soft face with blue eyes and the early freckle pattern across her nose and cheeks and blonde short hair. Her body is in good condition, though her arms appear lighter. Her voice box is covered in soft material and does make a sound when her string is pulled, but it's garbled and more of a screech. Her adorable outfit is a recreation sewn by my late aunt, who loved sewing for her dolls. It consists of a pink and white striped dress similar to the original with a white scalloped eyelet over jacket that snaps in the back. She wears soft knit white underwear (not sure if they are original), white socks and newer white Mary Jane shoes. She's cute and just waiting for a new home! *Click the link below to see a larger view of this doll with details.